High Speed Buffers (Part 3): Are There Limits to Commuting? Our series on HS2 aims to look at how it affects London. Finding a suitable terminus will be a big part of that, something that is dependent on a number of factors. A critical one is exactly what sort of railway HS2 will actually be. This is something that depends on how closely it conforms (or doesn’t) to conventional assumptions about long distance travel. So in this article we consider a crucial question – just how much of a commuter railway is HS2 likely to be? The very nature of a high speed railway requires us to consider the future geographic and time-related distances where London commuting might begin or end, before we think about the location of any terminus itself let alone what facilities it should provide. In theory, the HS2 network would become one primarily for intercity travel between the regions – of which London is one. It is not intended that virtually all journeys will either start or end in London. Whilst for the origin zones various options like park-and-ride may work, for regional intercity journeys it is generally important to have a city centre presence at the destination city region. Furthermore, this city centre presence needs to have good interchanges and connections to all parts of the city and perhaps beyond – not everyone wants to terminate their journey at the city centre. In contrast, commuting to London is not so dependent on regional connectivity. Commuters will sometimes relocate, if necessary, in order to be near their origin station or at least to have easy access to it. Crucially, London will be an HS2 destination that will be well connected. Regardless of the intended purpose of HS2, it seems inevitable that there will be an element of commuting. Just how much commuting will take place on HS2 is unknown, but we can get a good idea by looking at how suitable HS2 is for such journeys and also looking at commuting on both HS1 and other existing long distance routes, within conventional commuting times. We shall focus on this for the rest of Part 3. In order to try and gauge the importance – or unimportance – of commuting to London on HS2, let us look at HS2 Ltd’s preferences elsewhere on their proposed network for the location of stations. HS2 has started off with some poor proposed links outside London. Their shortcomings have been noted by recent comments from a York seminar in April 2016 involving 40 transport professionals who critiqued various topics including connectivity. It may be instructive to note that out-of-city-centre stations are the opposite of the thinking for HS3, where the Government’s stated desire is to improve city-centre connectivity in order to stimulate agglomeration benefits. The separation between HS2 and the ‘classic’ railway is expected to be substantial at Britain’s busiest non-London station and interchange, Birmingham New Street. If you want a measure of the current effectiveness of the station for rail travel, New Street saw 35.3 million passenger journeys in 2014/15 (ORR entry+exit annual flow) – a figure which rises to 40.7m if interchanging passengers are included. There is a Brunellian ‘change of gauge’ explicit at HS2’s proposed Birmingham city station, Curzon Street, 750 metres from New Street measured as station centre to station centre. This would be considered to be about a 10 minute walk by TfL standards. Moor Street station (6.9m including interchange) would be closer at 350 metres from Curzon Street. The HS2 station would also be served by a tramway extension and local buses. As a lot of travel in the West Midlands is by bus and therefore, as bus services are relatively easily rerouted to match demand, it is inevitable that Curzon Street will have fairly substantial direct public transport access. New Street station isn’t in the top league when it comes to measuring annual station volumes if one includes London stations. For example Stratford(-on-Lea) has 110m passenger journeys and Oxford Circus over 140m, including interchange – and these aren’t the busiest London station complexes. Nevertheless, for HS2 to fail to achieve an easy interchange with the most important entry + exit + interchange station outside London could be considered quite an omission. No-one would argue that a good interchange with existing rail services in Birmingham would be easy to achieve, given the local geography, but it isn’t happening at all. No amelioration is proposed either, such as a travelator-style walkway and/or a local station at Curzon Street on the adjoining West Midland lines. With the present propositions, travelling via feeder rail to Birmingham New Street then classic WCML to London may remain more reassuring as an interchange for some rail passengers, even if HS2 journey times are still about 20-25 minutes quicker after taking into account the inter-station walk. The effect of a lack of easy interchange will be to put off HS2 travel to those carrying luggage and for whom journey time is not so critical. In contrast the average commuter would probably be prepared to accept a ten minute walk if it meant a significant overall journey time saving. There is also a proposed regional ‘Parkway’ station, as a stand-alone ‘Birmingham Interchange’ stop, adjoining the M6, M6 Toll and M42 motorways and 1¼ miles from the airport (10.1m passengers in 2015), NEC and Birmingham International station (5.2m). A ‘people-mover’ is proposed as the only public transport link. Other proposed HS2 stations distant from the city centre include Sheffield Meadowhall (2.2m entry + exit + interchange passengers in 2014/15), which would be 3½ miles from central Sheffield (10.1m), and Toton as an ‘East Midlands Parkway’ roughly halfway between Derby (8½ miles, 4.4m passengers) and Nottingham (6 miles, 7.2m). That might get served by a tramway extension from Nottingham. However, as a contrast to previously mentioned proposed stations, at Manchester the HS2 station would be alongside Piccadilly interchange (27.3m, rail users only, and close to Metrolink) so giving HS2 a greater time and perceptual advantage there. There is also a proposal for a Parkway station at Manchester Airport (23.1m air passengers, 3.5m rail passengers). Crewe is now seen as the end of HS2 Stage 2a, possibly to open shortly after Stage 1, or at the same time as Stage 1 if that were delayed until 2027 which is now a possibility. There is a debate about whether HS2 should use the existing station or be very close by, or whether there should be a new Parkway-style station at Basford 1¼ miles south of the rail interchange and outside the town but on the A500 trunk road. Even at Crewe, this national railway junction with multi-way connections, HS2 appears to regard connectivity with ‘classic’ rail as not that important, and has favoured the Basford option, supported by Cheshire East Council. However this may not make operational sense with a Phase 2a ending at Crewe. Crewe Town Council favours a station within or abutting the present interchange. There has recently been a change of heart by HS2, at the end of November 2015, about the location of Leeds HS2 station. It would now adjoin the existing Leeds city centre station (31.7m annual passenger journeys) with a shared concourse, instead of it being at New Lane which would result in a 500m distance between station centres. This change of heart followed a successful campaign by Leeds City region. Sheffield is running a similar campaign to Leeds to put the HS2 station there within its city centre (at the former Sheffield Victoria station). Meanwhile, Greengauge21 argues for integration with the currently existing Sheffield station, formerly known as Sheffield Midland. Nottingham is now reported as aspiring to a direct HS2 30 minute timing between its Midland station and Birmingham Curzon Street, so 40 minutes with a walk to/from New Street and the city centre. This would require a £195m HS2-Midland Line spur near Trent (2011 prices) as reported on 18 March by Local Transport Today in March 2016. It would offer credibly direct ‘Tube-style’ journey times between two major Midlands cities, where typical rail times are currently 70-75 minutes. Whether it is also a subtle means to create the possibility of a 60 minute London-Nottingham High Speed service will be seen in due course. The National Infrastructure Commission (NIC) report on HS3, High Speed North, calls for the design of the northern phase of HS2 to “facilitate the development of the HS3 network, enhancing connectivity between Leeds and Sheffield”. The NIC’s longer term objective is also of HS3 30 minute journey times for a triangle of Manchester, Leeds and Sheffield city centres. So such ‘Tube-style’ timing is becoming a mantra for High Speed railway planning in the Midlands and North, and looks like being a factor in finalising the proposals for HS2 Phase 2. Whilst the NIC objectives are clearly aimed at regional commuting to support agglomeration (which does not directly affect how commuters would access London), this objective only really makes sense if HS2 stations are located in city centres. The increased connectivity could swing the balance towards ‘business travel’ intercity HS2 journeys to London but equally the regular, relatively frequent service and shorter journey times are likely to encourage commuting in that direction. Overall, looking at emerging preferences for HS2 station locations, the likelihood is of some greater HS2 Ltd focus in the final scheme on better access to city centres and existing transport interchanges, where there is space and it is feasible and affordable. This may incur additional infrastructure costs though potentially generate more economic value and passenger volume within the catchments served, so greater HS2 utility. Whether the Treasury would be comfortable with additional costs is another matter. For those stations that are intended to be both part of HS2 and HS3 it maybe that some costs could be allocated to HS3. Meanwhile, the provision of outer suburban/Parkway stations is not consistent, with none for the Leeds City Region nor further south (e.g. near Barnsley or Mansfield), although several Parkways might add value if a regional layer of 30 minute expresses were to come to the fore and use up spare High Speed line capacity in the Midlands and North. Such stations might merit serving by HS2 as well as HS3. Clearly, car-based residential flows via Parkway stations to/from London will have some environmental impact, though this is no different to what is already occurring elsewhere in low density and deregulated commuting territory lacking quality public transport as an access. Greater regional reliance on car travel might mean this didn’t matter so much for transport planning locally, unless the environmental imperative became more relevant for scheme approval. It has to be said a rather confused, unfinalised picture is emerging as to how much HS2 will serve city centres (or not) and how much connectivity with the existing rail network there will be. Certainly there appear to be potential commuting flows to London. There is also potential in the reverse direction with non-stop trains serving central Birmingham and Manchester, all in under 70 minutes. Leeds would be only an extra 12 minutes – comparable with Worthing – Victoria. When referring to reverse flows, we don’t just mean commuting from an intermediate catchment area (where are those within HS2, other than Birmingham Interchange, Crewe and Toton?) to Birmingham and Manchester, etc. We also include the possibility of living in inner London, and, for example, working at the BBC in Salford Quays. Looking at the bigger picture, could that be the best of all worlds for some commuters? The reality is that improving transport access to a particular location in order to stimulate growth at that location is a double-edged sword. What might now be instructive is to take a look at existing long distance commuting to London to get an idea of how far from London there could be significant commuter flows. The ECML shows a quasi-HS2 precedent with 45 minutes to Peterborough, 72 straight line miles from Kings Cross at an average of 96 mph. It is a popular non-stop service. There is a diminishing commuting element as one goes further north so by the time one reaches York, commuters to London (fastest trains under 2 hours) are fewer – but they do exist. Grantham, at an average 68 minutes, and Newark, at 75 minutes, are entirely feasible, and comparable in journey time with many south coast dormitory towns, though season tickets are rather pricier (but still regulated so not extortionate). The Great Western IC125 services have become increasingly commuterised over several decades, with moves towards high density seating, fewer first class seats and minimal buffet/restaurant services, rather than the original IC125 format for catering and with tables throughout the train. GW intercity timings have also slowed from the original 1976 speeds, with more intermediate commuter stops added, and some towns such as Reading and Swindon becoming ‘must serve’ regional business centres and interchanges rather than optional stops. Above all, there is HS1 and the Southeastern Javelins whose top speed is 230 km/h (140 mph). They are an important comparator to review, as they are London’s first genuine 21st Century high speed commuter services. Unlike HS2, where high speed services are planned to end up at the same terminus as the existing WCML services, the HS1 domestic services operated by Southeastern serve new domestic destinations for those transferring to the high speed service. Stratford and St Pancras are very different areas of central London from the historic Southern termini. The choice of London stations and the preferred alignment for HS1 on its approach to London has been covered in Part 2 of this series. In peak times an HS1 50-55 minute journey from St Pancras now gets you to Canterbury and Folkestone. That’s 55 and 64 miles respectively when measured as a straight line and this equates to an average speed of 65-70 mph. Such a speed is no different to an IC125 average between London and Swindon. The average straight line speed is rather higher to/from Stratford, which sets an interesting precedent for Old Oak Common and its positioning within the HS2 and GW network. Fewer HS1 miles and more miles on SE local tracks get you to Maidstone and also to the eastern end of Medway at Rainham in around the same time. In the case of HS1, fares were raised with a premium charge for high speed use. There was also an additional SE-wide 5% increase above RPI for some years for most South Eastern fares, on top of the high speed premium, so a tad eye-watering with extra season ticket costs. After some years in the doldrums with these destination and pricing disincentives, demand is now higher on HS1 as people adjust journey patterns, the London economy has recovered from the recession, beyond-London housing has expanded, and new journey-to-work flows build up. Examples of current passenger volumes which are HS1-exclusive are Ebbsfleet and Stratford International. ORR annual entry + exit data for 2010/11 and 2014/15 are: Ebbsfleet 0.41m and 1.47m, Stratford International 0.61m and 1.07m. Using typical divisors, Ebbsfleet equates in 2014/15 to under 700 per AM high peak hour inbound, which is not a large number, though area housing developments have scarcely begun yet. Stratford would be about 500 in the same time period. A recent sample count at St Pancras HS1 Javelin platforms showed about 3,400 passengers entering in the PM high peak hour to head east, so perhaps 3,700 exiting in the nominally busier AM high peak hour. Combining the St Pancras and Stratford volumes broadly equates to the 8 tph and mostly 6-car train service operated by the Javelins, and already with about 50 standees per unit. A further order of next-generation Javelins will be necessary as HS demand continues to pick up. The July 2011 London & South East Route Utilisation Strategy had put estimated Javelin AM high peak hour numbers at 2,500 at St Pancras in 2010, and forecasted 5,300 in 2031 (LSE RUS p7). No specific figure is stated in the 2013-2043 LSE Long Term Market Study. However, the sample count suggests that, 6 years beyond the stated 2010 volume and with 15 years to go to 2031, Javelin High Speed services combined with changes in jobs and housing volumes are already 43% of the way to reaching 5,300 passengers hourly, and at the present rate of growth might achieve the 2031 volume in 2024, with even greater numbers of passengers into the 2030s and 2040s. The transformation of the Stratford and Kings Cross Lands areas as new destinations has been a stimulus to travel on HS1. At the Kent end, Kent County Council is pleased with the changes in East Kent residential and economic patterns which have resulted. A Thanet Parkway station will open around 2019, with a 70 minute timing to St Pancras (average 57mph, 66½ straight line miles). Extension of HS1 commuter services to Hastings and Bexhill in East Sussex is supported strongly by that County Council, for area regeneration, and faster commuting and better links to London. Kent County Council is also backing the proposals. This is on the cards for the 2020s with potential for 70-80 minute timings provided Ashford West Junction is suitably altered. The average speed will be less than 48 mph average for Hastings-St Pancras based on a straight-line journey (present trains to Cannon Street average 30 mph on that basis! ), though nearly 70 mph following the actual route. The rolling stock providing such a service might be IEP bi-mode trains to avoid the cost of electrifying Marshlink. The conclusions to draw from HS1 are that it is still early days but that already passenger volumes and travel preferences have altered. Typical commuting patterns are becoming visible at up to 70 minutes rail time and beyond that, and with average home station-to-terminus speeds of 50-70 mph in straight line terms, influenced by the available rail infrastructure and its routeing. Changes in housing volume at the residential end and jobs volume at the working end will ensure that 12-car trains will fill with passengers in a few years. This is for journey times which put the new 140 mph Javelins only into the equivalent IC125 mph category or slower, after allowing for the share of journey on conventional tracks. Could High Speed 2 open up High Commuter 2? Now consider HS2. The London terminus is potentially the same as for WCML classic services, if Euston were adopted, so there is less disincentive to transfer to HS2. However, the HS1 example shows that a different terminus might not have too much impact on total demand for the combined routes, although willingness to transfer termini might incur some years’ time lag. A better located terminus might be a positive stimulus. The much-quoted 49 minute journey time from the edge of Central Birmingham to the edge of Central London via HS2, is for a train only stopping intermediately at Old Oak Common, with an average straight line speed of 122 mph. This shows the diminution of average speeds caused by any intermediate stop, even with very high acceleration and braking rates, for a line mostly timetabled at 320-330 km/h (200-205 mph), though at 230 km/h or lower between Curzon Street and Birmingham Interchange, and from Old Oak Common to Euston. With two intermediate stops, at Birmingham Interchange and Old Oak Common, a 53 minute time is achievable at an average 113 mph. This equates to a current Rugby-Euston Pendolino or Northampton-Euston Desiro timing (average 51 and 57 minutes respectively in the PM peak – and yes, Rugby is quicker…!) These flows are currently busy with London commuters. A 49 minute time from Curzon Street to Euston would be comparable with the fastest commuter journeys from Newbury to Paddington (50 straight line miles, 49 minutes average), and from Haywards Heath to Victoria (34 miles). With HS2 phase 2, trains from the London terminus wouldn’t deviate from the High Speed tracks until near Lichfield or Crewe on the WCML leg, or near Leeds on the ECML leg. They could maintain the timetabled 200-205 mph inter-station speed for 105-155 straight line miles north of Old Oak Common. The high speed effect of comparable journey times for much greater distances is the feasibility of commuting flows where they scarcely exist today. As long as the main line between London and West Midlands is intended for use by trains from the East Midlands and ECML territory as well as from the WCML, it is also the reality is that any extra layer of Northern and Midlands regional expresses cannot reach as far as London, because of the density of use of the southern end of the HS2 main line. The southern portion would be filled with intercity expresses between London and the West Midlands, including a timing of around 35-40 minutes between Old Oak Common and Birmingham Interchange (90 straight line miles, 135-155 mph). improvements to rail services are therefore likely to result in the greatest increases in economic output where it is possible to provide a step change in journey times between large urban areas with a current journey time of two hours or more, to substantially less than that. This is particularly the case for journeys to and from central London. There are other relevant studies such as the Long Distance Market Study. 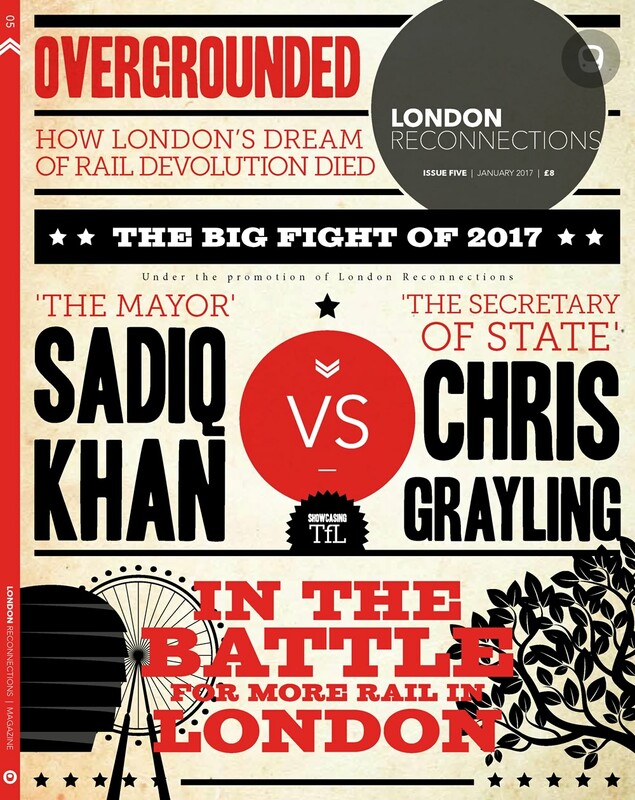 As background, London Reconnections has already published analyses of forecast travel and commuting pressures in its London 2050 series. Network Rail generally is forecasting large increases in commuting over 30 years on conventional rail by 2043 (if anything the numbers will be looking bigger now). All forecasts are pointing towards further increases in commuting volume, driven partly by the foreseen growth in jobs centred in London. We live in a broadly free market economy. It has many imperfections of course, which are for politicians to try to address. However, like it or not, a large proportion of the English economy has now become London-centric. The effective London catchment is now measured in journey time. You can’t turn the clock back on these structural changes in the economy, though you might seek to influence the future. Transport is a means to an end, but it can and will reshape the ends. Actually that’s what Governments want at a macro-level from HS2 and HS3 – but can they control the real-world outputs? Planners originally saw the M25 as a London bypass, not as offering a new London & Home Counties travel-to-work lifestyle, but it rapidly took on that role, allied to its stimulus for large-scale land use changes in the Home Counties. Improving capacity on the London-Midlands corridor with easier access to the London Region for the purpose of business travel, will inevitably open up possibilities for commuting. Improving also the ability to access other major city regions (an objective of HS3) can help to mitigate the effect of the London ‘wen’ – but it will still be up to those regions to achieve a sufficient counter-balancing economic pull. Affordability of homes is another pressure – where in London could you now get hundreds of thousands of extra homes built and costing less than £100k or £200k, or the rental equivalent? Primrose Hill? Bromley? Everywhere will have its difficulties. London needs upwards of 40-50,000 extra homes each year, but is falling far short of that in delivery. There are some schemes (such as for the Upper Lee Valley, later to be on Crossrail 2) which will stave off some pressure, but the practical outcome is more commuting, from everywhere that there is a decent rail service. What does this mean for HS commuting? Why should HS2 be exempted from this national trend? Does anyone think it can be? It could be part of the London housing solution, if the railway is to happen and London’s housing capacity remains constrained while more jobs continue to arrive in the capital. People will take advantage of quicker journey times which access areas with more affordable homes, and will do the classic trade-off between travel costs and mortgage costs, as demonstrated by HS1 and its Javelins. Commuting will be an unavoidable outcome – the DfT might not want to admit it, but it will happen. Indeed it is already happening, even with present journey times. See for example the usage of London Midland trains from Northamptonshire and Warwickshire, and Virgin trains from Rugby and Coventry, and the year-on-year growth in station usage there (noticeable in the ORR statistics). What also has to be recognised is that, irrespective of HS2 existing or not, or routed to Euston or not, any alternative scheme for the WCML which fails to accommodate an increase in commuting capacity in one type of train or another is going to be thrown out by Network Rail as well as the Department for Transport. They consider that the lid will not stay in place on the commuting pressure pot. Whether or not you think HS2 is a good thing, extra capacity on Britain’s busiest intercity transport corridor (London-West Midlands) is needed in the future, and basic railway planning has to accommodate forecast increases and start designing for them now, as it takes so long to justify and authorise and then build any railway infrastructure. Already, on another busy line into London, Network Rail is now planning extra capacity on the GW fast tracks into Paddington with a flying junction and extra track towards London from Ladbroke Grove inwards. Network Rail considers that it will be required to accommodate 24 trains per hour (tph) by the mid 2020s, on the fast lines which are generally non-stop from Reading to London. That’s in addition to Crossrail foreseen as 24 tph at Old Oak Common when HS2 opens. So nearly 50 tph on that corridor. The following annotated map is a 2016 train time overlay for radial main lines north of the River, based on fastest average times from London Zone 1 termini (or tube equivalents) in the PM peak period, so avoiding the London arrival timekeeping margin which is frequently added in the AM peak. The PM margin can affect times, but only at some outer termini (Stansted is infamous for it). Concentric circles are shown at 25 mile intervals from Central London. An overlay is shown for HS2 Stage 2, with HS2 timings assuming stops at Old Oak Common and Birmingham Interchange. Faster times would be achieved with non-stop running (eg East Midlands 51 minutes, Crewe 55 minutes). There is a point to observe: that there is already a large variation in journey time inconsistency about London’s reach to other parts of the Home Counties, including whether areas have a direct London service or not – or indeed any railway these days. HS2 will increase such differentials. A further comment made already is that reverse flow commuting, which is a growing feature of the conventional London & Home Counties rail network, could also apply with the HS2 network. Live in high density inner London (maybe Old Oak Common in the future with its planned 20,000+ homes, or for that matter along Crossrail 1 or Crossrail 2) and your accessibility to jobs within 70 minutes will be very considerable, and not just London-centric. The map shows average fastest PM commuting times in minutes from London main line termini or equivalent, in 2016. Some Underground boundaries are taken as the main line equivalent, rather from the end of Oyster Zone 1. Over 80 minutes, only direct trains from London are shown. Mapping shows 25 mile circles from Central London, HS2 Phase 2 and outline HS timings. From the map we can see the HS2 overlay of a new railway offering timings to London which are well within the norm for existing London commuting. The Birmingham-London sector would achieve a 40-45 minutes Curzon Street-Old Oak Common journey time if non-stop, and around 50-55 minute timings for a journey between Curzon Street and a London terminus. These are tube-type and conventional commuter journey times. 70 minutes is a typical Brighton-London terminals time in 2016. Commuting from much of the south coast, Kent, and from some northern Home Counties as shown in the map, can take longer than that. Brighton Electric began operation on 1st January 1933. Will we see a Birmingham Electric look-alike on Sunday 13th December 2026? HS2 to b2e or not ‘tu-be’? – that is the question. Birmingham as London-on-Canals with HS2? The key ingredients for such an outcome are fast train times, and further moves by Birmingham to create a quality central and inner City – which is the City Council’s existing desire. There is a caveat, that a sufficient catchment for Curzon Street station requires effective integration with Birmingham city centre, New Street station and large-scale local regeneration in neighbouring Birmingham Eastside and Digbeth. The Birmingham Curzon masterplan shows Birmingham City’s current thoughts on that caveat. Moor Street station is also shown as easy to access. Curzon Street could also gain a wider city region catchment base if an adjoining local West Midland network local station on the New Street corridor could be built. Is that feasible? Who would pay? Such a network isn’t in the Curzon masterplan. By applying a general 70 minute commuting yardstick to HS2 we could see where 70 high speed minutes would allow you to be transported from. In future decades, that would link you from much of North Warwickshire and North Birmingham (such as Sutton Coldfield) by car to Birmingham Interchange. Birmingham New Street plus possibly several local rail stops beyond (more if better interchange were possible there), Solihull via Moor Street, and West Bromwich would be possible by train. Nuneaton is already only 65 minutes on average from London during the PM peak. 70 minutes with Phase 2a would get you easily to Crewe (and Stoke), and with Phase 2 full to Central Manchester, the East Midlands and Sheffield. How much would a OyHSter Card be? By the 2030s, based on experience with HS1 and on present timings for HS2 Phase 2, the three per hour Manchester High Speed trains (at 67 minutes buffers to buffers calling only at Old Oak Common) and a percentage of the Crewe and East Midlands calls could be showing significant commuting characteristics – much more so in the case of the three per hour Birmingham trains. All trains calling at Birmingham Interchange could also show a significant commuting element. That is the bulk of the 10 tph West Coast HS2 services. Other commuting opportunities could feed through with the full Phase 2, with some dependent on the extent to which easy-access city centre and Parkway stations were adopted. In part 4 we shall consider the information gleaned to look at the London terminal and what factors need to be taken into account when locating it. As ever an interesting article. A request and some comments. Firstly is it possible to make the annotated map of journey times larger when zoomed? It may just be my eyes but it’s not easy to read. Alternatively making it accessible as a larger image in a new tab in a browser would be good. Coming now to some rambling thoughts. For me the absolutely crucial issue is the cost of a ticket on HS2. I fully accept that we can’t know now what they will cost despite some “stakes in the ground” having been laid out. I’m sceptical that there won’t be surcharges as there on HS1. If the pricing is somehow “wrong” then I can’t see that you will get considerable commuter flows no matter how quick the journey is. The lack of effective connectivity in Birmingham is laughable I’m afraid. That really needs sorting out. While I understand why JR said buses can be rerouted I’d venture to suggest that Birmingham is one of the worst places to do it. Since the City Centre was remodelled and pedestrianised most bus services no longer connect in the centre. They are grouped into “nodes” of stops for particular corridors out of the City Centre. The nodes are scattered around the City Centre. Unless you’re prepared to schlep across the City Centre you can’t connect between routes. I assume the buses don’t even try to connect because there is not the road capacity nor stop / stand capacity to do so. Last time I was in Birmingham I witnessed the snail like PM peak traffic speeds near Moor St (so not far from Curzon St). It was taking buses 15 minutes to go barely a few hundred metres – that makes Oxford St look like a race track. The queues of very exasperated people waiting for buses were huge and growing by the minute. It’s going to take some really radical work to ensure Curzon St has sensible bus links from across Birmingham. The other key factor is whether currently empty land and unattractive inner areas of places like Manchester and Birmingham can be sensibly and sensitively redeveloped with housing that is reasonably affordable when put alongside the cost of a HS2 season ticket to London. If it’s just left to rapacious developers who want a fast buck from people forced out of living in London then I won’t view HS2 as any sort of success in terms of easing the housing crisis. Agglomeration benefits are all very well but some careful planning is needed to secure the right results for people already living in Birmingham, Manchester etc as well as those from the south who may be tempted to move north. As a small aside when I was at LU I knew people who commuted from Margate, Lewes, Newbury, Pewsey, Shoeburyness, Grantham and Rugby. The last one was the one that surprised me as the individual involved was always in the office by about 0700. They found the trip on a Pendolino and then the Tube perfectly acceptable although even then (5 years ago) it was a struggle for them to find a seat on the train. What it’s like now I dread to think. (Sorry for the triple post, I really need to organise my thoughts better). Also, I absolutely love that Birmingham Electric mock-up; shame about the front of the train! If there are any aspiring art-deco-style artists here who can make a modern-looking train frontend in that style, I’d love to see it improved! If HS2 has very high prices and doesn’t pull in the punters, then it will fail as a capacity railway supposedly relieving WCML. You will also need lots of passengers to start to reimburse the interest costs and operating costs (GH has made such remarks in the Part 1 discussion). Interesting point about the Birmingham bus structure. Connectivity at Curzon Street will be important. Well done for spotting the timing lacunae between Oxford and Banbury. Even triple-checking seems to have overlooked those (Tackley and Heyford) – evidently they are quite forgettable! I’ll update the timings – the answer will be north of 59 minutes (Oxford). If over 80 minutes, only the average time for through peak trains will be shown. The map is the result of a lot of graft and patience. Average fastest times from London termini or tube equivalent were assessed for 4pm-7pm for every station shown, based on the published Dec.15-May.16 national timetable. At a much enlarged scale, virtually all radial stations north of the Thames in Greater London are shown, including tubes and DLR, where stations aren’t too close together. Apart from a few examples used in the text, stations south of the Thames aren’t relevant to the HS2 articles, so analysis and mapping wasn’t undertaken. Timings for Waterloo-Reading and Reading-Farnborough stations are shown where there is an faster average time via Paddington-Reading (including real interchange times at Reading), until the point that Waterloo-based journeys become quicker, which is Martin’s Heron (the first in green, at 58 minutes, the same as shown for Bracknell via Reading). Is the source of the HS2 journey time data in the public domain? I have not seen this level of detail before and I failed to find anything like what’s in the article the last time I tried to research the subject. Seeing as you mentioned Nuneaton, I wonder if the London commuting effect is whats preventing Labour from winning the seat now?, perhaps we’ll end up with the outer London home counties. In terms of reverse commuting, wasn’t one of the first trains from Kings Cross to Cambridge top the list of most overcrowded services a few years back? They will share a concourse (as you almost point out later)! OK, they are perpendicular, but it’s Curzon Street’s really long platforms that make this distance so high. That said, the classic lines platforms at the far end on the New Street lines would be very good. And throughout HS2: Travelators to help deal with 400m long platforms and long interchanges. One to New Street would be very useful and pretty cheap. It’s a rather short extension, in the Phase 2 plans. I think ‘might’ is a bit pessimistic. Also there would be a classic rail station right alongside. – Brum is a very difficult case; either Curzon St can be readily accessed from within Brum itself by bus or it can hardly be accessed at all on a regular basis for commuting, but the parts of Brum that are easily bussable are hardly promising propertywise. The second half of my comment is based on two thoughts – and I would welcome them being shot down : firstly, only a 10min walk between NS and Curzon Street may be so, but reducing a commute to a five leg journey each way will be a big turn off for many. Secondly, if the time penalty (and interchange penalty, including that walk!) is added in, for some at least, conventional trains will continue to be as attractive as now (and maybe cheaper). One difference of behaviour between commuters and non-commuters may well be that commuters are prepared to walk through the train before it arrives at the terminal to shorten their walk along the platform (and vice versa in the other direction). It would be interesting to know figures for commuting on other high speed rail networks – I believe there is a lot of Shinkansen commuting in Japan, despite high price differentials with non-high-speed services (but an absence of yield management pricing). And I think plenty of people commute Paris-Lille (but do they prefer Lille Flandres, the New Street equivalent, to Lille Europe, the Curzon Street?). As WW points out, a lot depends on ticket prices, but for commuters it is not just a question of whether prices are higher or lower on average – how much will they fluctuate according to demand? Will there be season tickets, and if so what discount, if any, will they attract? What regulation, if any, will apply to fares? An operator starting with a blank sheet of paper would not necessarily choose to replicate the byzantine current British fare structure, which is the product of decades of political and commercial wrangling that sometimes seems to leave nobody happy (although they will be constrained by the existence of parallel services that are priced according to that structure). You should sell it to local estate agents to use in their publicity (I’m only slightly kidding). Toton / E Midlands parkway is merely repeating an earlier failed experiment, when the Midland Railway, for some years, ran its best Sheffield trains via Toton, then called “Trent Junction” with connections to Derby & Nottingham. After a while, they gave up & alternated Derby/Nottingham as the intermediate stop. Or electrify “Marshlimk” @ 3rd-rail. of course …. Discuss – but not here & now, I suspect! Fares – the herd of elephants in the room. ISTR that someone on a Thursday evening (ngh?) said that, actually lowering the fares on HS2 would “do the trick” & fill it up, & make a profit too. Also, that studies had been done to show this, but I can’t remember the source of such. Unfortunately, I suspect that a ridiculous premium will be charged, though & the trains will be empty, or so cynical old me expects …. With regard to Brum and Curzon Street’s connectivity to bus services, I wonder if the tram will help to connect the station with those bus nodes that Walthamstow Writer mentions. Far from ideal, but I write as one who is just getting used to doing that in Sheffield, where the station is very poorly connected to bus routes. As an aside, the map shows what I have observed on many journeys on the Midland Main Line. Leicester is 66 minutes from St Pancras, and the frequency of fast trains is fairly good. Do the stats show that city as a growing source of commuters into London? The illustration at the head of the article shows the most comfortable commute imaginable! (Including pots of tea!) Or is that just the First Class Lounge? Lille Flandres is not really the equivalent of Birmingham New Street, because most TGVs to and from Paris use Lille Flandres and not Lille Europe. Only those from further afield (e.g. Calais) use Lille Europe. Whereas no HS2 trains will be going into New St, apparently. Curzon Street, according to this document is 49 minutes from Euston (I presume that this is referring to the 1tph modelled that doesn’t call at Birmingham Interchange). As WW points out, a lot depends on ticket prices, but for commuters it is not just a question of whether prices are higher or lower on average – how much will they fluctuate according to demand? Given the huge amount of extra capacity I’d expect the pricing structure to be far flatter with much lower elasticity most of the time. If you have the capacity you don’t want to price you marginal passengers away unnecessarily when you have debt to pay down. It’s not my idea of comfort. The chap at the left is having to both sit forward on his seat and lean forward in order to use his laptop. The people at the table to the right have no seat backs. This clearly has no basis in reality. Should that be ‘HS2’ or have I completely missed your point? RayK: You have missed the point, though perhaps it could have been clearer. 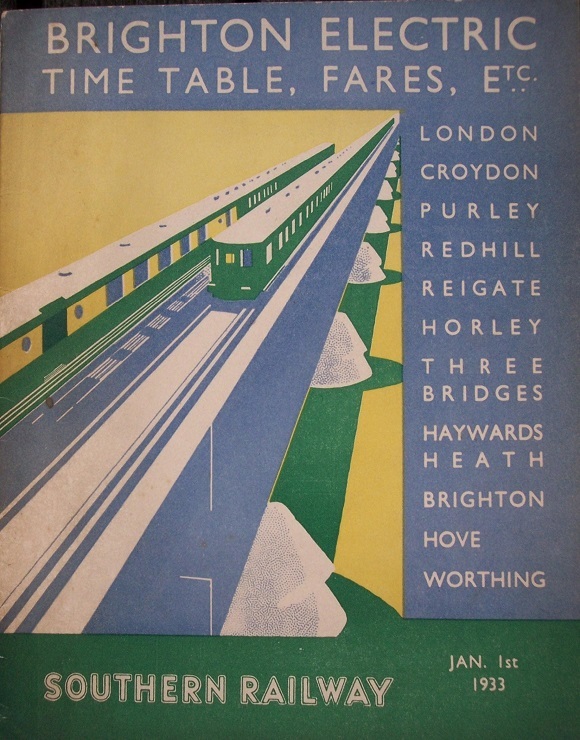 The part 2 article does include the history of the possible approaches to London of HS1 and its predecessors. Confusing, because similar matters regarding HS2 are also covered in the present series, touched on in every part (including part 2). The difficulty of getting to Curzon street by public transport (from just about anywhere except places with trains to Moor Street) prompts me to wonder whether significant number of cyclists might commute on HS2 from the West Midlands. (I presume only bringing their bikes with them on the train if folding). I recall being surprised in 1978 that a colleague (even then) commuted daily to Goodge Street from Swansea, so the idea that people will use HS2 for commuting won’t be a total shock, however it does seem that – with the exception of Manchester and Leeds – the local (distant) connection will detract from the benefit of switching. As a former commuter I also wonder whether the time it will take to walk along such long trains (whether onboard or on the platform) will also detract from the overall point-to-point speed. One thing which concerns me about the staged creation of HS1; once you’ve built the first stage to B’ham you can either run as many services as possible, in order to make best use of the asset, or you can underutilise it by leaving diagrams ready for the planned expansions. If you go with the first then users will get used to that level of service (and we all know how much removing something creates headaches*) but not doing so could be seen as a (temporary) waste of investment. * eg. Wimbledon loop _through_ the core not just to Blackfriars. And just to add to the excitement (and evident distress of the LR Twitter account) it seems Alstom are proposing a double deck HS2 train. That’ll do wonders for dwell times, walking through the train and the crowds of people the stations have to handle. 😉 There is also a possible single deck variant with tilting capability for the “classic compatible” trains. Still they already have a product range so you can’t blame them for extrapolating a design from their existing capabilities. I suspect it shows how out of touch Alstom are. I’d love to know how they think using power cars and not distributed traction will work for a likely HS2 train spec (after what happened on eurostar). They really need to be able to read the tea- leaves (or even just LR) better! Both Meadowhall and Toton have, or will have, conventional rail stations. There are a lot of Sheffield commuter services that stop at Meadowhall at present; I expect that many Nottingham and Derby commuter services will stop at Toton. Even if they are not destinations in their own right at present, it may well be possible to commute through them. The key weakness by not being central is not for people from the Sheffield, Derby or Nottingham areas wanting to travel to London (or Birmingham, Leeds, York or Newcastle) but the reverse; anyone wanting to travel to Sheffield or Derby or Nottingham will not find Meadowhall or Toton at all convenient. As for Birmingham, the absence of platforms on the New Street lines at Curzon Street is ludicrous, and will surely be rectified eventually, if not perhaps in time for the opening of Curzon Street station. Less than £100k? A parking space maybe… Rightmove is offering a studio in South Norwood for auction with a guide price of £100k. It’s pretty tough to find anything more than a studio in greater London for less than £200k. Basically, it’s never gonna happen. Perhaps that’s your point? Thousands of decent family homes for less than £500k would be a more achievable dream. Right now you are into outer suburbs if you want four bedrooms for under a million. So Euston has the Underground. Meadowhall has a tram service as well as a non-stop train to Midland station. Yes, indeed, Toton will be served by a tram in about seven minutes time. Toton is also expected to have local trains to Nottingham City centre. I don’t see a problem with using double deck trains for the HS2 captive services. In fact they probably make good financial sense. The duplex services in France work perfectly well. Dwell times aren’t really a problem on all-seated limited stop high speed services. JR 08.47, Si 10.22: The Birmingham-specific fact sheet appears to say that the 49 minute timing to London (as it is compared with 1hr 24mins this should be Euston) is available three times per hour, which in turn suggests this is the timing with stops at both Interchange and Old Oak. Unless I am stretching the logical reasoning. WW 01.11, Fandroid 09.29, Malcolm 11.06, etc. : So is it now OK to repeat my post from the Transport Path Ahead thread?! “If LR really is debating the future development of the West Midlands’ public transport networks, could I put in a plea for the discussion to start with the real, published, post-consultation regional transport strategy with its new stations, line reopenings, etc? Noting that the first two rounds of upgrades are specifically connected to HS2 connectivity for the region. However, both Old Oak Common and Birmingham Interchange will have two through platforms per direction, plus (in the case of the latter) one non-platform line per direction. Therefore, any extension of dwell time due to use of double deck stock (within reason) does not critically affect line capacity overall, as the ‘next’ arriving train will use the opposite platform face, with some buffer before the first platform has to become re-occupied once again. Regarding city connections in the East Midlands and South Yorkshire, my understanding is that HS2 has considered these as destinations that are more diffuse than the major centres of London, West Midlands, Greater Manchester and West Yorkshire. It follows that the station proposals are put forward to act as hubs for the respective sub-regions rather than city centre access. As noted in the thread above both Toton and Meadowhall are intended to have both heavy and light rail links to the surrounding towns and cities, as well as being accessible by bus, car and indeed providing ready-made transport access by foot for the anticipated development of the immediately surrounding areas. A particular issue affects the East Midlands of course – at this point HS2 is on a north-south axis while the two principal cities are directly east-west, and so serving one centrally would directly disadvantage the other. One way to “fix” the East Midlands station issue is massive growth. Specifically, public policy could encourage the creation of a new combined city joining Derby and Nottingham with Toton as its new economic centre. But, given this is Britain, this is of course unlikely. Birmingham just needs two platforms on the New Street approach next to Curzon Street as pointed out in the article. This could be achieved easily if Curzon Street were sub-surface, with the classic platforms on top. But, given this is Britain, this is of course unlikely. The lack of local connections from Birmingham Interchange could also be solved relatively easily. A connection from Interchange to the line to Coventry would also allow increase use of the northern legs of HS2 by giving the services somewhere to go when they hit the congested southern HS2. But, given this is Britain, this is of course unlikely. The lack of integration with the Overground at Old Oak could also be fixed relatively easily (discussed elsewhere). But, given this is Britain, this is of course unlikely. With these four things above, HS2 commuting would be far greater, with a much bigger reach, relieving pressure on housing in London. But no-one seems to have ever stopped and thought about what HS2 could provide to the economy and movement patterns beyond simply existing, something that may yet haunt London. Except they will all be stopping at OCC and lots at Birmingham interchange, Toton, Crewe etc. Short dwell times and high acceleration + deceleration are assumed for rolling stock as this has been used to reduce the number of platforms required at intermediate stations! So it isn’t an option or a choice. It will be difficult to achieve the desired energy efficiency (regenerative braking) without distributed traction. HS2 is not the same as French LGV so copy and paste based on France doesn’t necessarily hold especially with the proposed platform heights. I’m willing to bet that won’t be the case even before phase 2 opens! OCC passengers with lots of luggage for Heathrow anyone? Also have a think about the moving block equivalent of signal overlap length vs the actual loop lengths. Do this article and discussion mean that Manchester, Sheffield, and er, Nottingham heavy rail and tram services are now acceptable topics for discussion in the L-R zone? Would our highly esteemed Moderators please advise. While idly musing, I wonder if HS2 mileages would be measured from Sheffield Victoria in the same way they were by its predecessor, the GCR? As this Part 3 is about the potential of commuting to London, all discussion of the transit services of Birmingham, Manchester, Sheffield, Nottingham et al were directly related to accessing the planned HS2 stations in those cities. So the comments will be moderated to keep to this standard. I spent a month in Japan last year, travelling all around the country by shinkansen “bullet train”. I got talking to a businessman on the train to Nagoya (he wanted to practice his English on me), and he explained that he commuted from Nagoya to Tokyo everyday. He explained that thousands of people make the journey every day – a journey of about 100 minutes, at a cost of 11,000 yen (£68) a trip. This initially astonished me – that’s a 350km commute (London to Manchester ever day) but then he explained further. As an aside, I’m very glad that JR could be soon bidding for franchises in this country… So impressed by Japanese railways. @JamesScantlebury – “As an aside, I’m very glad that JR could be soon bidding for franchises in this country… So impressed by Japanese railways.” Then you will be sorely disappointed. The engagement of foreign bidders in the UK transport sector has so far failed completely to introduce foreign methods. Did you noticed the French* influence on the franchises they won, or the Dutch, or the German influence via Arriva? * Not sure what this might be – “toujours en greve” perhaps? @Graham H: Yes, quite agree! To do that you’d have to rebuild the railways, throw out the rule book, retrain the staff and get rid of the whole franchising system as it exists right now! @JS Can one also assume that if an employer purchases the commuter’s tickets, that this means they will also get a seat and a place to work on the laptop for those extra 200 minutes a day? I might have to stand up all the way through my tube ride home, but I know that there’ll never be the expectation that I’ll keep working during it. A former colleague who had a 60 minutes each way car commute welcomed the driving time as “time to think”. Not sure I would have felt the same. @Malcolm There have been a few surveys on preferred commute length and it seems to be somewhere between 15-19 minutes, whether this was walking, running, cycling, bus, tube, train or car (or boat, as a friend of mine in Stockholm likes to gloat about via instagram). Any more and it becomes a chore; much less and it doesn’t allow you to ‘decompress’ at the end of the day. Obviously, some prefer it to be longer than that. If you’re driving home it may take some people an hour to unwind. Thanks for (clear and practical) guidance. If a Curzon Street stop were developed on the existing lines, you’d obviously want as frequent a service as possible from New Street. Considering New Street capacity is constrained by the number of platforms and number of trains terminating here, you might bring more West-of-New Street services through to terminate at Curzon Street rather than New Street. You’ve solved your Curzon Street HS2 connectivity problem and increased New Street capacity by reducing number of terminating trains. I realise Curzon Street gets a lot more expensive with a lot more platforms for turn-back facilities, but New Street will never get more platforms as I understand due to Bullring Shopping Centre foundations being in the way. I think a key issue here will be the ratio between the season fare per week and the peak time return fare. A greater ratio would encourage business/leisure travel at the expense of commuting. Incidentally the article suggests at one point that HS2 phase 2 will end at Crewe and Lichfield and near Leeds. It also includes the high speed line to Manchester. GCR mileages were measured from Manchester London Road not Sheffield Victoria. Marylebone buffers are still extant at 205 miles 77 chains. It would be eminently feasible to measure mileages (sorry, kilometrages?) from Manchester’s proposed HS2 platforms alongside London Road (aka Piccadilly) station – provided HS2 Phase 2 were built. There are Putney and Greenwich residents who commute by boat as well. “Birmingham just needs two platforms on the New Street approach next to Curzon Street as pointed out in the article. This could be achieved easily if Curzon Street were sub-surface, with the classic platforms on top”. Only true if every train stops at that station. No. Maybe it could be written more clearly, but Lichfield, Crewe and near Leeds are the first places that HS trains can diverge from the new main lines and rejoin the classic routes – so will be slower from then on, which is the context of the paragraph. It is NOT meant to imply that the main lines end at those locations. Part 1 describes the general HS network in more detail. But it then causes potential issues for the next stopping train (train 3) at the adjacent platform after the non stopper due to the short loop lengths and required overlaps in some locations as the first train leaves. See Crewe or East Croydon P4/5 for how this causes issues now and why you won’t see it happening at London Bridge Charing Cross lines in the future when all the works are done. Actually kilometrages can be measured from anywhere, on or off the line in question (as is well known on the London tube lines). So they could be measured from Manchester, along the proposed route (which is well-defined) even if phase 2 were never built. However, Euston would be a more obvious choice. Irrelevant. You have to think of train paths. If all trains stop then each train just drops back a train path and there is no loss of capacity. If a train does not stop (and most do) then it occupies two train paths and no amount of shuffling will retrieve that. Similarly if a train does stop (and most don’t) you also use up two train paths. Concerning turn back facilities at a Curzon Street station on the New Street lines – I thought that Birmingham International was currently used for that purpose for eastbound trains. Given the Camp Hill chords proposal, which would mean more trains to more destinations on the Moor Street to Snow Hill line, it seems to be a lost opportunity not to create a Birmingham version of Faringdon at Curzon Street. Surely the four tracks between New Street and Proof House would each need a platform as the need would be to provide connections to both the ‘LNWR’ (Coventry-Stafford stations) and the ‘Midland’ (Worcester to Burton) lines. The point of a Curzon Street interchange must be to attract passengers from, say, Coleshill, Longbridge or Wolverhampton who will not want to change at New Street. A more logical option is to add a through connection from Curzon Street onto the classic network – this would allow a ‘classic compatible’ from Wolverhampton to couple to another set (a suitably shortened HS2 ‘captive’ set) already waiting at Curzon Street then head off to London – much like French TGVs do. That way you don’t overload local services with interchanging passengers yet still extend the reach of HS2 services in the West Midlands while simultaneously maximize train paths by combining services for the haul to London. Some discussion of possible stations and interchanges in Birmingham (or other non-London stations) is OK, since some of the issues are raised in the article. But please try not to overdo it, as we would like to keep the main focus on London Implications. Clearly some commenters have in-depth knowledge of the relevant areas and their transport plans – but those (like myself) who know less about such matters are cautioned against asking general or naïve questions which might widen the non-London discussion beyond what is desirable. (Nobody has done this yet, that I’ve noticed; this is a pre-emptive warning). Just to note that some of the “commuter” lines in the Birmingham area are being electrified in the next few years (civils work has already started) as infill type schemes which should help reduce the number of services terminating in New Street as services can then be joined up like Thameslink etc. to create through services when the electrification has been completed thus providing far more sensible options (fewer changes) for getting passengers to Curzon Street. To take Pedantic’s powerful comment about train paths one stage further, if exactly half (*)the trains stop then you may be able to recover most or all of the capacity (subject to sufficiently long run-ins, run-outs and over-run strips), but you will have a much less robust timetable which starts crumbling badly if even one train is presented out of order. (*) Or another simple fraction like one third – dependent on line speed, number of platforms, and dwell time. The out-of-town HS2 stations will have large car parks and are reasonably accessible by road (that last half-mile is a bit messy in some cases). I know Ebbsfleet, which is similar, is somewhat of a failure in this respect, but the situation HS2 stations find themselves in is more promising – eg a lack of other stations closer to where people live in the catchment area (eg Gravesend) with High Speed trains to London. Driving to a station is a fairly common thing – Amersham, Chalfont & Latimer, Hounslow West, Stanmore, North Greenwich(! ), Epping and Newbury Park (and possibly some others that I’m not aquainted with nor managed by TfL) all have more than 400 spaces. The second newest rail station in the UK (Oxford Parkway, 7 months old today) is a station sited at a large car park so people can drive there and get a train into London (and, to a lesser extent as the buses would be cheaper and more frequent, Oxford) that takes roughly an hour. The success (or lack of) of this station would be a helpful indicator as to the market for commuting on HS2. If there was ever an opportunity for widening the viaduct it is now. Four through platforms alongside the new terminus, as at London Bridge or Manchester Piccadilly, would be a much more integrated solution than having Lichfield, Coventry, etc passengers trundle right past Curzon Street and then have to walk or tram back from new street. The car park sizes given or suggested by Si above show why park-and-ride commuters are unlikely to make much impact on HS2 commuting numbers. 400 spaces (to be used once a day, mostly with driver only), which is a big car park, would only half fill one train (out of 18 per hour). I wait to be shot down over this, but here goes… I was under the impression that the HS2 intermediate stations had two platform faces for each direction because one was British (classic compatible) loading gauge and the other European (captive) loading gauge. Possibly not that different conceptually from someone who walks every day from the Thameslink platforms to the Victoria line at St Pancras, say, (or the dreaded “Smile” tunnel in pre-St Pancras days, or even Euston to Euston Square). Off-putting for infrequent travellers or those with luggage, but I tend to think that for many commuters the only question that matters is “what gets me there fastest” – eg. the large numbers who choose to walk over London Bridge to the City rather than wait for a Cannon Street change. Interestingly the tram route through Birmingham city centre to the HS2 station will also be used by “Sprint” BRT buses – is this the first case in the UK of the same physical stops being used by both trams and buses? And is this a subtle form of bus re-regulation, if only Centro’s special Sprint buses can use the route through the city centre? The proposed West Midlands local connectivity package relies heavily on Metro extensions and Sprint buses, and the Camp Hill chords to bring more trains into Moor St in Control Period 6. There are also similar buses planned to Birmingham Interchange mentioned in the same package so the reference in the article to the people mover as the only public transport planned there isn’t quite right. But I suspect in the long term a Curzon Street station will ben needed on the WCML even if only to support all the development planned in the area. @ngh, WW: The other advantage of distributed power trainsets over locomotives is that the track forces should be less than with all the equipment in the loco – as I understand it Japanese high speed trains (which have always had distributed power) are significantly lighter than French ones. The quote in the article that “the single-deck proposal borrows heavily from the fleet Alstom is to supply to Amtrak for its premium Acela Express service” doesn’t inspire confidence, given that Acela is by far the world’s heaviest high speed train. But all les anglo-saxons are the same, non? @James GB: As I understand it the classic-compatibles will have the ability to use European gauge platforms, just like the original Eurostar trains. Ian J 01.52: I didn’t see a date on that connectivity package, but I think it has been superseded by the finalised “Movement for Growth” that I linked to yesterday at 13.22. As a daily commuter from Birmingham, can I add some comments. Firstly the key assumption is in the pricing. A simple challenge – does HS2 need to offer season ticket discounts? or discounts at current levels? That is key to commuting. Just because every historic line has offered it does not mean that HS2 needs to. Secondly, the biggest concern on travel is the London connection. Saving a few minutes from Birmingham is pointless if the result is a tube misery on the Northern City branch or Victoria line. Thirdly, the location is flawed and a concern I have for both Birmingham and Manchester is the “shadow effect” on the areas to the north of the big city which lack through trains. Not so much on commuting as business travel but there is a gravitation of the professional classes to the south side where the airport and London parkway stations are. That is a regional development issue rather than a London issue. Finally, you also look at HS2 commuting as commuting on HS2. One planned impact is that it will free up classic capacity and the biggest use of that will surely be competing Pendolino based commuter trains. Competition returns to pricing and the big question is HS2 demand and whether HS2 needs to commuters. BTW, absurdists will enjoy the overnight comment of one Ben Ruse, HS2 spokesperson who claimes that HS2 will reduce emissions by encouraging people to switch from cars and, err, trains. It will reduce emissions if the trains being switched from are those currently operating on the Chiltern or Midland Main Lines, at least one of which is unlikely to have been electrified by the projected date for HS2 opening. However, they still think it should be done, but with tweaks …. @timbeau -given thatMML will have been electrified by the time HS2 opens to the East Midlands and the bulk of Chiltern’s Brum traffic is fromBrum’s southern suburbs (at least that’s what they say), then, no,the numbers switching from diesel traction will be small and certainly not in sufficient numbers to make a major difference to emissions.. Perhaps Mr Ruse meant “planes”? It is also sadly the case that – as the Board’s own policy unit studies showed – whether (diesel) trains are more environmentally friendly in terms of emissions/passenger km depends crucially on assumed load factors (ie the weight of the passengers in a train is a small portion of the total load to be shifted). C a modern (future ULEZ compliant) car containing (i) one person (ii) four people? D a Class 68 and six carriages plus a DVT, full-but-not-standing? E other comparisons are available. I submit that emissions per passenger kilometre are the right measure. Thinking about emissions one quickly realises that the traction emissions are only part of the story. Emissions during construction (big steel machines powered by compression-ignition engines) as well as the production and transport of concrete & steel construction materials play a part. Too many people seem to ignore the fact that electricity is *not* a low or zero emission form of energy; many Londoners, in particular, are ignorant/unaware of this since the closure of the Thames side coal fired power stations. * or half full. The reason it’s not full is that HS2 proponents say “it’s all about capacity”. & see Alison’s conundrum on 25 May at 11.11 am. Crantock* 07.35: I note your reference to “saving a few minutes”, which seems at odds with the 30-35 minute savings given for HS2 on both Birmingham central and parkway journeys to Euston, compared to cutrent WCML services**. Is this because of the New St-Curzon transfer (you don’t give an originating point in Birmingham)? *Nice part of Cornwall, by the way. **With the exception of the once-a-day, one-direction-only flyer which may of course be your regular morning train but may not continue once HS2 Phase 1 opens. Greg re: HS2 Overpriced: the Daily Telegraph on March 21 2016* came up with a figure of 10x comparables, so the 5x mentioned by the BBC looks like progress! The Telegraph has a table, but the BBC today just has a few quotes. I’ve asked Harrobin on Twitter for a link to his primary source but no reply so far. I’m sorry he sees fit to describe himself as an ‘analyst’; there’s precious little analysis in that report. Possibly, but it has already been delayed once, (announced in 2011 to be finished in eight years, then after four of those years (and presumably some work) the completion date was moved to 2023). Seems to always be eight years in the future, however much work has been done. @OB – very much the point. (And since neither we – nor anyone else – have any data about HS2 pkm – any claims they make about being more-emission friendly than any other mode are worthless). I also agree with your point about energy impacts of construction; for new railways,it’s not just the new kit but also theenergy costs of construction traffic and earth moving – not negligible items. @timbeau – and what is it that makes you think that HS2 to the east Midlands won’t slip just as much as MML electrification? Or indeed,that it won’t be cancelled 5-10 years hence? My understanding, given the environmental reports published so far, is that the best guess for the green credentials of HS2 is that it will be roughly environmentally neutral all told. But that the guess is very inaccurate (e.g. it could be much better or much worse, depending on how it affects travelling etc.). I don’t think it contributes anything to the argument for HS2 either way. @Graham H: one* could take actual numbers from my lettered comparators against an estimate of pkm based on the timetable model and the ‘half full’ wet finger in the air, according to my trusty BOFP**. “Better to be roughly right than precisely wrong” as a former boss taught me. I would also use that pkm estimate to tell me something about likely revenues, based on a range of ticket prices. If I was on the board of HS2 (OB) plc, looking at raising finance, or a financier estimating risk and reward. In any event, as Ian Walmsley demonstrated in Modern Railways at the turn of the year, total UK rail transport emissions are irrelevant at the global level -which is the one that matters. That puts emissions saved from modal shift onto HS2 into the “you could estimate it, but why would you bother?” category. Still, I don’t suppose either Mr Ruse (nominative determinism lives!) or the anti HS2 mob (I use the word advisedly) will allow facts or careful estimates to get in the way of telling their tales. * ie neither you nor me, but a person with access to the data who is paid to do the work. **BOFP: back of fag packet. Igor Judge, Lord Chief Justice from 2008 to 2013. [Off topic alert] I was actually thinking of Mr Bond who took over the Barclays equity-gilt study just at the point when gilts began to outperform equities after ~50 years. Other factors may have been involved in that reversal. They are all probably commuters, though not likely from the West Midlands or points North. @Graham H. Hugh Fish was more than a mere spokesman for Thames Water. He was chief executive (early 1980s). Crikey – I had it in mind that one ought to appeal to my lord Dawlish for the resumption of sanity back when the theme appeared to be redesigning Birmingham, but look where the discussion is now…! Just let’s have a sense of proportion. Occasional digressions into meanings of words, or other extraneous matters, are not encouraged, but may be occasionally tolerated (or, admittedly, added to) by moderators. Just so long as we mainly talk about HS2 and limits, if any, to commuting. Did his middle name start with a G by any chance? Re: possible IEP Bi-mode “to avoid the cost of electrifying Marshlink”. I find it hard to believe that the costs associated with lugging a diesel or five from Ashford to London all day every day, quite fast, on an eye wateringly expensive IEP, just so you can use it for the last 20 miles or so, are insignificant. Are these costs really so low that the cost of electrifying Marshlink (at 750v, presumably) is not affordable? Marshlink is a diesel ‘island’, (like Uckfield but we won’t go there, at least on this thread) so there are other operational railway benefits from electrification. On cascades, will it too late to re-rent the 171s to Northern after a wash & brush up and some TLC? I can see that the revenue side of the business case might be hard to build; you’d be putting a lot of faith in ‘build it and they will come’. The non-railway benefits seem chiefly to be about making London more accessible, and I wonder whether that will appeal to that section of Hastings society who chose it partly because it was cheap. The IEP story smells of “we’ve ordered them so we’d better find some jobs for them”. And on the cost side, I wonder if there’s a certain amount of loading up the job with things that would need doing even if you used IEPs, like re-modelling Ashford. Am I alone in thinking these things? Maybe the answer to Birmingham is land trains this could run from hs2 platform to new Street dropping of at concourse. Going back check the tickets have a few trains for different location and drop the passengers off by there coach. I think you are asking the wrong question. The question that Network Rail was asked before the election was “is there a business case of any kind for electrification of Marshlink* to allow Javelin services to the marginal constituency thriving South Coast metropolis of Hastings”. The answer came back after the election, “no way”. Meanwhile IEP-derivative bi-modes have become flavour of the month for new and extended franchises (Great Western, Transpennine Express, and Hull Trains have voluntarily ordered some, amusingly in the apparent belief they would be built in Japan and not from Hitachi’s newly-acquired factory in Italy, the one that built the Danish IC4, the Dutch Albatros, and other such high quality products…). So the (safely re-eelected) local MP has fallen back on bi-modes as a face-saving gesture. Expect similar interminable lobbying from local politicians calling for bimode services from HS2 to Holyhead, Shrewsbury, etc etc. Are there limits to commuting indeed? * There’s a bit of a clue in the name, there. @Gerald: there will be a land train from New Street to Curzon Street (via Moor Street) – it’s called Midland Metro. Free travel for through rail ticket holders, London Underground-style, would be useful. Ian J: re: Hitachi Rail Italy, they’re also building the Frecciarossa 1000 which is being tested at 400 kph. I guess the Pistoia-built kit is okay but the Palermo/Naples/Reggio Calabria factories’ output, err, maybe less so. Hull Trains is open access so reliable kit probly matters more to them. I guess one factor in their decision would be sharing the ECML with other IEPs. Amber Rudd is now Secretary of State for energy & climate change, with a majority of over 4000. I’d be surprised if she drops the issue. Re Marshlink, I think the emphasis is on “link”. Greg @2301: thanks. Good to know. I thought the class 800 were the bi-modes? Virgin East Coast has promised 14 per day Harrogate to London return. I also thought that the 800 and the all-electric 801 were to be assembled in Hitachi’s new factory n Newton Aycliffe? Social cleansing of St Leonard -on- Smack Sea? 2. There isn’t a full compliment of 395 to enable all current services to run as 12 car (2x 6car) so top up order of HS1 spec stock preferably compatible with the 395 equivalent to 10x 395 units would be ideal without Marshlink being added (Indeed these extra units providing more capacity from Ashford -St Pancras alone would be a sensible alternative to E(D)MU. 2x 5car 800 series units would be equivalent to a 13car 395, Marshlink itself would only see 1x 80X as the platforms are only 1 – 4 20m cars so will all need extensions or SDO used (which is fitted). The extra cost difference between 10x 395 or 12x 80X isn’t that large? 3. At 33 track miles and with excellent Grid supply potential (400KV) I can’t see why OHLE isn’t a go-er (apart from no passengers to justify paying for it and no electrification engineers or plant available in the desired!) Back of Fag packet estimate £40-45m? 4. 800 not made in Italy. Well GWR got had on the follow on “West Country (Exeter and beyond)” order then, just as well Hitachi have a factory in Durham to rebuild them after a few years when required! 5. I wonder if the local name of the newish Hastings express service created after local MP pressure will be used to brand the new services? From memory the first 12 units were to be fully assembled in Kasado and the balance with final assembly in Newton Aycliffe (no friction stir welding equipment in Co Durham so the body shells are shipped from Kasado). Unfortunately the desired delivery dates (pre 2020 for PRM etc reasons to avoid HST modifications) for the follow on orders combined with no capacity in Durham or Japan has lead to some final assembly in Hitachi’s recently purchased Ex Ansaldo-Breda plant Italy [Search for “Fyra”]. Hitachi bought it for the signalling not the rolling stock manufacture! I do wonder whether IEP (Hitachi brand) was really originally specifically meant or whether this is sloppy wording for “some kind of dual-mode train”. My speculative interpretation was that this was for a future order for extra trains for HS1 including some units capable of being powered by an independent source (most likely diesel but who knows how fast battery technology will move on). I can’t help thinking this “shiny thing in the middle of nowhere” strategy is horribly ill thought out. It’s a recipe to throw away most of the benefits of HSR, generate road traffic, and create stations people don’t use. The regional parkway stations in Spain and France often get tiny numbers of passengers. I mean, come on, no New Street? It’s good news that Leeds managed to get sense on this, and I guess it’s down to the cities to press for more of that. Politically, it’s about time they stopped with the “why not start at the far end” stuff and started with “how do we get the best out of the investment in HS2/2a/3”. Ashford “C” Jn, that is what I’ve been hearing too. (Lots of £m…). The common sense option for me is more electric only trains on HS1 (and to/via Ashford trains). Then use the money saved on the difference between buying more 395s and even more Bi-mode IEP + not revising the track layout at Ashford “C” Jn on increasing the service level between Hastings and Ashford for example by using the additional 170s (but aren’t being converted to 171s) that Southern leased back to Scotrail for the time being also being converted to 171s for increasing service levels and capacity on Marshlink. Also has the advantage of less splitting, jointing and conflicting moves at Ashford. In other news the first 10car 171 run was this week. I wonder if GWR, TPE and Hull were aware when they ordered Hitachi that it would be manufactured in Italy (runs away screaming) instead of Japan or UK. Hitachi better be cracking the whip down there in Italy! @Alex: The French call them “Gares des betteraves” or “sugar beet stations”. However, the area around Curzon Street and Moor Street station bears little resemblance to a field of sugar beet, and it’s certainly not a regional parkway station. Birmingham Interchange may perhaps have a few more of the attributes of a parkway station, but some of those are quite successful in Britain, probably by being within easy reach of built up areas. Yes, of course better interchange with New Street would be highly desirable, but it seems to have been found unfeasible or unaffordable by the HS2 designers. I suspect that the difference between the Leeds situation and the Birmingham one does not lie in how hard local interests pressed for better interchange. It was probably because the Leeds improvement was found possible and cost not very much more than the original plans. It is OK to touch on these matters, but we will not allow extended discussion of them here, as our emphasis, as always, is on their impact on the London region, (and detailed knowledge of the situation elsewhere is very unevenly spread among our potential commentators). So how would you do HS2 to New Street? With Leeds the main issues with the original HS2 station not being joined to the existing ones was to do with flood risk on the River Aire so they originally elected to stay south of the river rather than the more expensive option of straddling it. The new proposal for Leeds is T shaped so you could still have to walk 500-600m if connecting at Leeds. The new Leeds proposal requires slightly more city centre demolition than the original but there appears to be local support for that not sure it would be the same in Brimingham given the side effects needs to do the same at New Street. Extending New Street would offer the best solution for passengers, but unfortunately it is not feasible. Even if the cost could be justified, an additional new station would be required somewhere else in the city, and existing trains services would be severely disrupted during construction. Room for a Taxi Rank has been conveniently left between the New Street – Rugby and Derby tracks and the HS2 station, the rank could easily be moved if desired to add some adjacent platforms (not cheap though as the existing tracks are on brick viaduct). The key to making interchange at Birmingham work is having all the services into New and Moor Street electrified and the max number running as through services to enable an overall increase in frequency reducing potential waiting and journey times. I am running the risk of making the sort of uninformed comment about Birmingham which I was warning against, but it does occur to me that a very cheap amendment to the Birmingham proposals would be to build the platforms exactly as planned, but rename New Street + Moor Street + Curzon Street as “Birmingham Grand Central” with platform numbers running in a single sequence. A better analogy to the Curzon Street/New Street problem is probably Marylebone, which when it opened in 1899 was 500 metres from the nearest Underground station at Baker Street. At the time the Bakerloo Line was little more than a hole in the ground -and a much bigger hole in the finances of the London & Globe Finance Corporation. ngh: As you have quoted HS2 on extending New Street, do you have any idea what they mean by “an additional new station would be required somewhere else in the city”. What function is this additional new station supposed to serve? It’s all about perception – if people can be persuaded to see it as one big interchange instead of changing stations. What function is this additional new station supposed to serve? What I think is meant is that although you may be able to extend some of the platforms lengthwise to take HS2 trains, there is no room (widthwise) for any extra platforms so the trains currently using the platforms to be extended for use by HS2 would have to go somewhere else. Ngh 12.41: The originally-published HS2 plans called the central Birmingham station Fazeley St, and it hasn’t moved since. I suspect the influence of Lord Adonis in the name change, which helped the opposition by giving the impression that the station exit would be somewhere near the original Curzon St building (which, just for fun, isn’t on Curzon St itself either). Malcolm 13.02: I believe the function of the hypothetical additional station would be to cater for those trains displaced from New St by the HS2 services – the statement looks like a reductio ad absurdum argument on the practicality of HS2 to New St. Anyone commenting on this all must understand that New St is a subsurface station hemmed in on all sides by the city centre and full to capacity with train movements. We can cry as long as we want to over the spilt milk of this, that or the other missed opportunity to increase station capacity, but personally I don’t find that terribly conducive to the debate about the future. Back to the subject of commuting vs. other uses of passenger railways and central vs. out-of-town stations, I think it is at least of passing interest to note that driving into a city centre station to catch a train is presumably much less attractive than driving to a parkway station. And to some extent makes more efficient use of the car leg by avoiding congestion. On the subject of commuting patterns and housing, I don’t see the East West link mentioned at all? I know a final corridor between Cambridge and Oxford is a long way off, but the western section would seem to open up new possibilities? As a resident of Central Bedfordshire, there’s a lot of currently open space that wouldn’t be an especially excessive commute from zone one (or indeed Birmingham) once the various phases of EWR start coming on-stream, and I fully expect property development to kick off in some sort of fashion before too much longer. Could that have hitherto unforeseen effects of HS2 usage? New Street, Moor Street and Curzon Street have unique longstanding identities, so perhaps a ‘Birmingham Central Stations’ moniker would be a better description, whilst maintaining the names of individual stations for wayfinding purposes. @Phil – seeing as HS2 and E-W don’t come within many country miles of having stations near each other, it’s not likely that their markets will overlap/influence each other. @Alison I think the only politic thing would be to run only those trains which will be in the final service pattern, as far as they can go, i.e. terminating a large number at Birmingham Interchange initially. @Malcolm Remember there’s more to it than simple distance. A 400m walk indoors through a shopping centre is quite a different proposition from a 400m walk exposed to the elements and crossing a couple of busy roads. There may yet be scope for a decent interchange but it’s going to take more than a couple of signposts. lmm says “Remember there’s more to it than simple distance”. Indeed, and it was in recognition of that which I made my not entirely serious suggestion about renaming. However small the effect of that might be, its cost-benefit ratio might still be favourable because it would be so cheap (though not really cost-free, as there are expensive signalling ramifications, as we know by the dotty platform-numbering which persists at Stratford). Oddly enough I prefer (at least in reasonable weather) to do the Stratford hike in the open air (though a difficult route to find) rather than through the shopping centre. But I may have a greater than average dislike of “retail opportunities”. But the general conclusion, that one should not judge the ease of an interchange by simply measuring it, is one that I very much agree with. Other factors are important. For example Winslow isn’t a really a London commuter town at the moment but in 2019 is 1 stop to Bletchley then into Euston which might add more LM passengers at Bletchley etc. (and do things to local house prices in Winslow too). lmm: I agree (with you and Alison) that (phase-1) running more trains to central Birmingham than will (post phase-2) be possible would be asking for trouble. But running them instead three-quarters empty to Birmingham Interchange would be a very expensive use of the extra trains – if they have even been purchased at that point, which is anyway fairly improbable on cost grounds. @ngh – of course, but still nothing to do with HS2. I have not studied carefully the plans for Euston (which will, I think, be the subject of a future part of this series). But given that the Euston rebuild is very much on the critical path for the whole project, I suspect that, until phase 2 opening date, the number of available ready-for-use Euston HS2 platforms will be only just sufficient for the phase-1 services proper, without any provision for phase-2 ghost trains. Indeed plans for East-West Rail are interesting, and I think John Bull would be very receptive to offers to write an article about it. But until and unless there is such an article, we do not really want discussion of it to be shoe-horned in elsewhere. Indeed, but I didn’t raise the point initially which someone else did in response to the article title of” Are There Limits to Commuting?”. It has an impact on what happens to WCML after HS2 opens in various phases and is another string in the bow of service pattern rehash. Aber naturlich.. It was Phil who raised the issue, and you who seemed to pick up that baton. There is no direct market overlap between HS2 and E-W. The more useful question you raise is whether HS2 will release enough capacity to enable “round the corner” commuting services such as Winslow -Euston (or perhaps Bow-Euston, which on some evidence might fill a peak train) to which the short answer is that no one knows. As discussed above, it depends on how the capacity cheque is cashed. Since Bletchley and CMK between them already have commuting numbers based on some fraction of the population of Milton Keynes (255,000 or so), it seems to me that a similar fraction of Winslow’s 4,400 (or even 8,800 if it were to be doubled by the mentioned new housing) would be an almost imperceptible increment. The consolation-prize observation does not really make Winslow discussion any more appropriate here. In fact the Winslow blip in WCML numbers will probably be even smaller than I thought, since Winslow is currently (and will remain) a 17 minute drive from Aylesbury Parkway station. Re Euston Phase 1 capacity. The current Additional Provision 3 plans for Euston HS2 in Phase 1 allow only for 6 HS platforms in use, which would be used at a rate less than 2 trains per hour per platform, for 10 tph diverted West Coast intercities (at broadly the present service frequencies). HS2 Phase 2 aims for 18 tph in 11 platforms, with a similar platform re-usage rate. Longer turnround times are allowed for NW and Scottish HS trains, than for Birmingham which are set at 25 minutes layover. Readers can consider whether they think that is efficient or not for 21st century new railway planning. Jonathan: Thanks for that. Readers can indeed consider whether .. (what you say), but we would welcome guidance from you on whether the results of that thinking might best be delivered here, immediately, or whether such results would be better held back until a future part of the series. (I realise, and stress to other readers, that the timing of publication of future parts is partly or wholly out of your hands). @ Ngh 1241 – I’m sure you’re correct about the distance between Curzon St / New St but the environment is in no way comparable to Victoria. Now Victoria might be a heaving mass a lot of the time but it’s undercover, well signposted and free from road traffic. In no way can the same be said for Birmingham. Moor St Queensway is a dual carriageway but variable amounts of traffic. There is a main bus turning point outside Moor St Stn and then you have the choice of going through a shopping centre that resembled the bowels of hell last time I went through it or walking via the service road in dingy light and choking fumes. There is then another road to cross. Now it may be that some radical pedestrianisation scheme happens but I don’t see the shopping centre disappearing any time soon. I certainly would not want to be walking between Curzon St and New St in the evening for a late connecting train or doing it on a wet, cold Winter’s day. It remains to be seen how effective any tram connection will be. I note the new tram service from Snow Hill to New St runs to the sparking frequency of every 15 mins in the evenings and on Sundays. That’s enough of a wait time to miss connections and last trains and if it was replicated for Curzon St it’d be a waste of time if you just missed a tram and had the full waiting time. I fully recognise the physical issues at Birmingham but it’s a great shame that more can’t be done to better integrate matters and offer the prospect of more effective transport options for passengers. Probably more use responding to a later part of the series, is the advisable answer – not that I’ve completed drafting yet for that part of the topic! Wasn’t intending to derail the HS2 discussion and apologise if it seems that way. I’m just curious as to how much the completed EWR might tilt commuting patters from their present axis, which I thought could be relevant, given the wider discussion about commuting patterns in the original article. At least everyone involved acknowledges it is a problem and wants to do something about it. @ Phil – where things could get interesting with EW Rail services is that DfT are currently considering whether to make it a separate “micro” franchise to encourage new entrants into the market (source – Franchising Schedule update). That could create a load of issues in itself about how well the services integrate into the service patterns of other operators who may wish to run over parts of the infrastructure as well as with connections. Given the possibility of commuters having multiple termini options in London plus many other destination possibilities on or off the route itself I’d agree with GH that defining the market / identifying impacts is very difficult. It strikes me that that EWR could end up triggering completely unexpected travel flows that could present problems on pathing and capacity in various locations. I also agree with GH that it shouldn’t present any obvious material issues for HS2 (as we see things today). The bowel of hell referred to is presumably the (relatively) new Bullring shopping centre? It is now a place that has ample natural light unlike the Canary Wharf shopping centre which really does seem to fit the “b of h” monicker! (And sits on the spot where my office was for the first 5 years of my career, thus perhaps increasing my dislike of it). But relying on any short cut through a shopping mall (especially this one in Birmingham) is less than ideal as it simply increases congestion in busy periods (i.e. Saturdays) when the luggage of hesitant travellers meets the carrier bags of confident shoppers. But let’s for now assume that the designers of the whole central Birmingham station links will put the interchanging passenger’s (sorry, customer’s) needs first and hold fire until we have the detail and then hope the mods have sharp scissors handy. re: EWR round the corner services into Euston – surely Winslow could have services via Amersham? All MK-Oxford stations will, of course, be getting trains to Marylebone via High Wycombe, though that’s a long way round to Aylesbury (but HW-MK justifies extending those trains beyond Aylesbury, rather than the via Am ones). 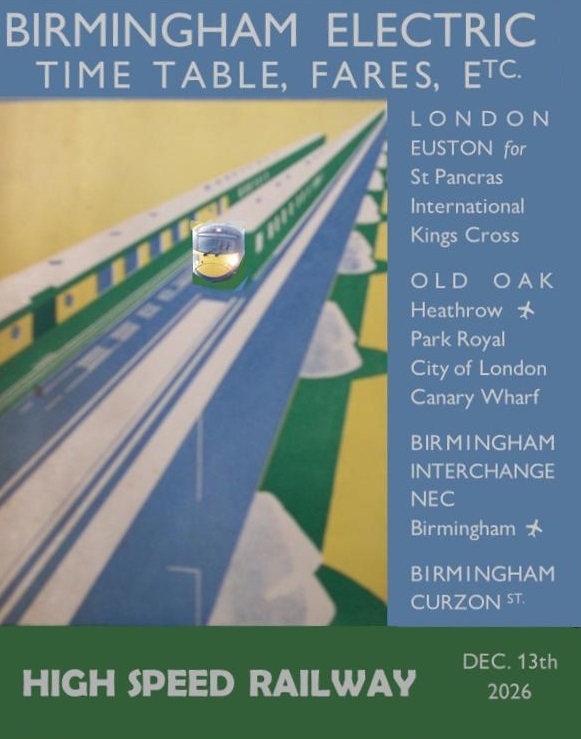 re: Birmingham connections – if only HS2 was a more concrete thing earlier. 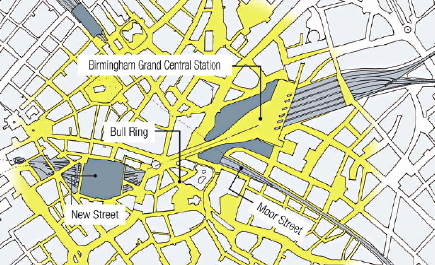 Arup’s ‘Grand Central’ proposals for a large Curzon Street-Moor Street station replacing New Street as the major station in Birmingham would have been an excellent terminus (provision had been made in the plans for HS2 platforms alongside both sets of platforms, allowing a choice of route into Birmingham. Birmingham CC liked it, and kept the area clear for some years, Network Rail had the ‘not invented here’ problem but were too hostile: the real issue was the Minister for Transport who was hostile enough to the proposed (and now built) New Street works as it was. Birmingham CC, when work started on New Street, started allowing development of the ‘Grand Central’ site, so it can’t be recovered. There is of course a decade to go before anyone actually needs to transfer between New St and Curzon (latest documents have dropped the “Street”; personally I ferl that the existing Moor St and new HS2 stations should be combined under a new name – as per my previous post I don’t much like “Street” names for railway stations, especially when they have multiple exits). Various documents, including the connectivity package linked to above, habe made reference to a concept of ” one station for Birmingham” but details are hard to come by. My understanding was that the redevelopment of Birmingham New Street station was a City Council initiative and the Grand Central shopping was an integral part of that. Anyone who has ever exited from the old station to the city centre knows that the route led you through the awful Pallasades shopping centre (think Elephant and Castle and you will get the idea). No doubt if Network Rail had come up with a serious proposal for a rebuild involving increased station capacity, the City Council would have been happy to go along with that (as long as the shopping was sorted too!). @Fandroid. Yes it was. But the ‘Grand Central’ name originated in the alternate plans for a massive station on the Moor Street and Curzon Street sites and then used for the New Street shopping centre as it was a good name. Sadly Arup seem to have removed their documents showing the original ‘Grand Central’ scheme, though I did manage to find this overview map. Looking at central Birmingham’s current layout, I can’t help noting its resemblance to the situation in Croydon, with its East and West stations. While bus interchange sounds like a pain, could trams be a solution here? If passengers can get the exchange trip included in their tickets, it effectively becomes free at the point of use, so might not necessarily feel like a big deal. Frequencies would need to be high to cope with trainloads of HS2 passengers, but it seems doable given the right infrastructure. I agree, Anomnibus but in Croydon, the fine concept which you suggest, as indeed originally promoted, that Tramlink would easily facilitate ‘exchange’ connections between West & East Croydon stations (which it does to the best it can on the rails), actually never came to pass, in that that there has never been some form of “OSI” between the two as we had expected. Accordingly, one must pay again when boarding a tram if not using some form of zone travelcard or pass between the two stations themselves. One can compare that, of course, with the natural Continental practice (with many variations but admittedly not universal) of permitting transfer between stations, without extra charge, using the connecting tram &c. services. I don’t know whether it still exists but there was a point-to-point ticket valid to both inter alia East & West Croydon stations but if you ended up at one when you wanted the other, then you had to pay the tram or bus fare between the two. Back to the main subject of the article, my office in Holborn had from as early as 1978 for several years a daily commuter from Leicester (100 miles from St. Pancras), three partners travelling at least three times a week between Bristol and London, one partner daily from Southend, two from Haslemere/Portsmouth environs, and one once a week from our Leeds office. They all took it in their stride. The fares, especially from Leicester, were dear but compared with local employment salaries, the staff salary at the Holborn office outweighed the disbenefit of what was then a long, weekday return journey. Having said that, there was a proper breakfast and dinner on offer on the comfortable Leicester trains (no rowdy diesel engines roaring under their seat to start with). @Graham F – -I believe the earliest recorded long distance commute was an employee of the East India Company who resided in Brighton but came up to London weekly by stage coach (with a pouch of papers sent down on the other days). In the early 90s we had a bridge four who commuted daily from Newport on the 125 – in the days when they had no problem getting 4 seats together with a table in the middle. I am sure this experience was skewed from the norm as a consequence of having almost all our commuting costs paid by our employer. @Paying Guest -and skewed even more if you were a BR employee with an all-system first class pass. There was the GM of EC who lived in Micklegate in York and commuted to the HQ in Eversholt Street by Euston-a tad over 2 hours door to door- although the prize went to a member of the Policy Unit who came in daily from Wem. @Graham H – for a short time we had a chap who commuted to Whitehall from Edinburgh Airport – the home to duty regulations didn’t specify mode of travel, just class! Not long before an administrative amendment closed that loophole. Somebody else paying does make a difference. Of course, in our unequal society today there are plenty of high-income people who could easily afford season tickets for really long journeys without noticing the dent in their bank balance. But with such an income, they are probably free to make different choices (of residence or workplace) to avoid using up such large amounts of their time. Length of commute was definitely skewed in the past (and maybe still is) by mortgage companies’ disinterest in travel costs when assessing someone’s ability to repay. Simplistic formulae (like a multiple of annual income) were the reason for many wage-slaves’ long daily trips. In my student days in the 1970s a colleague spent a term commuting to South Kensington from Ipswich. And when I started in my present workplace, I heard of a recently-retired member of the staff who had for many years commuted daily to Bloomsbury from Shanklin – a commute which involved a hovercraft! There are other factors, such as a desire not to uproot family, particularly at crucial stages in their education, which may influence such decisions. In many occupations, career progression may require frequent changes in workplace between central and regional (or even foreign) offices, military establishments, or similar, often at short notice. Indeed, and it was a choice I made when my workplace was relocated. To avoid family upheaval I then commuted from outside Rugby to outside Leatherhead for three years, via Euston and Wasterloo. Oh joy – I found that trains were a great place to catch up on my sleep ! This graphic appeared on the Guardian’s website yesterday – and highlights the massive geographic ‘pull’ of London commuting compared to other urban areas. Curzon St was the first part of HS2 I bought into, city site with regeneration. My visualisation though was of commuting / business facing the east and north. Birmingham and London are close and big enough that the time getting to a HS platform becomes a factor. Use of International to OOC as a segment in the overall journey makes more sense. On pricing the government says its proposals “assume a fares structure in line with that of the existing railway” and that HS2 could generate sufficient demand and revenue without needing to charge premium fares. Would the HS1 5% be considered in line with and not “premium”. Sir Higgins advocates airline fare demand management. At this stage there’s an element of “They would say that” to maintain support. The likelihood is for revenue maximisation to fund investment using add on service fees. I’m afraid, the capitalisation of HS2 is such that it would require the entire revenue of the UK railway system to service it – and then some. The article here about Euston is discussed more in part 4. Where there are FAQs directing commenters to threads or discussions is more helpful than an assertion that someone somewhere sometime previously has said something similar. The discussion above implies that tilting services will not have a future on WCML. Is there still a place for that technology in the UK. The Japanese have continued to develop it and are employing them more widely to improve ride comfort. Agreed tilting has been used widely for narrow gauge expresses, but has only more recently been adopted in the N700 series Shinkansen units. The system incorporated in that design is limited to only a tiny tilt of up to one degree, and is designed primarily to allow a small but comfortable speed increase on the tightest curves of the earliest HS routes.